In Panini Express, authors Daniel Leader and Lauren Chattman bring the warm, melted, grilled goodness of panini right to your kitchen. 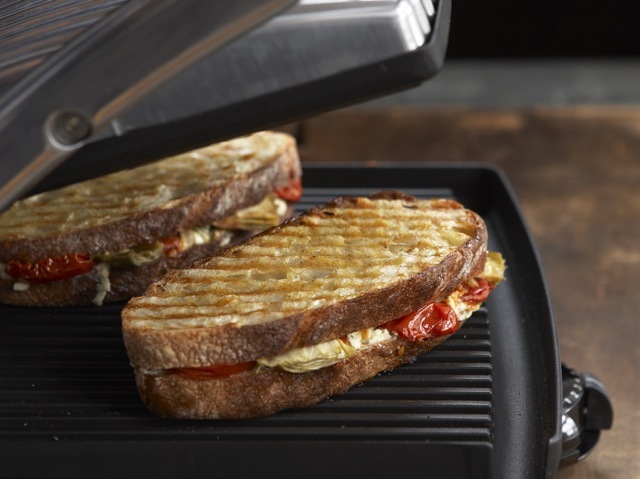 With 70 easy recipes for deliciously different sandwiches you can make with your panini press, savoring the flavors of Italy has never been so easy. Leader and Chattman go beyond the traditional to offer up a world of tasty treats: Artichokes, Roasted Tomatoes & Goat Cheese on Baguette; Caesar Shrimp & Arugula Sandwiches; Ham, Brie & Apple French Toast; Roast Beef with Blue Cheese & Bacon on Ciabatta Rolls. There are even dessert panini (try the Open-Faced Blueberry & Crème Fraîche Brioche Sandwich) to sweeten your palate. p(blue). This week's Cookbook Friday drawing is for copies of Panini Express from Taunton. Enter to win the book by adding at least one of the recipes featured on the left to your Culinate member page recipe queue. p(green). Crave more? Win a set of 12 Taunton Press works, [/mix/contestsandgiveaways/cookbookfridays "learn more here"]\. p(blue). That's it — you've entered! (All entries must be made between Friday, July 31, and noon PST on Friday, August 7, 2009.) Check back each Friday for a [/mix/contestsandgiveaways/cookbookfridays "new drawing announcement"] and other chances to win. p(blue). This week's Cookbook Friday drawing is for copies of Panini Express from Taunton is now closed. Congrats to this week's winners:  [/user/AlexDavis Alex], [/user/newbie511 Peter], and [/user/Barrie+petersen Barrie]. h6. \Entry closes at noon PST on Friday, August 7, 2009. Winners will be then be drawn from all valid entries. Eligible winners must have U.S. mailing and addresses and reside in the U.S. Please note that all standard Culinate contest rules apply to this drawing.